Sabrina (Sabrina Fair/La Vie en Rose in the United Kingdom) is a 1954 American romantic comedy-drama film directed by Billy Wilder, adapted for the screen by Wilder, Samuel A. Taylor, and Ernest Lehman from Taylor's play Sabrina Fair. 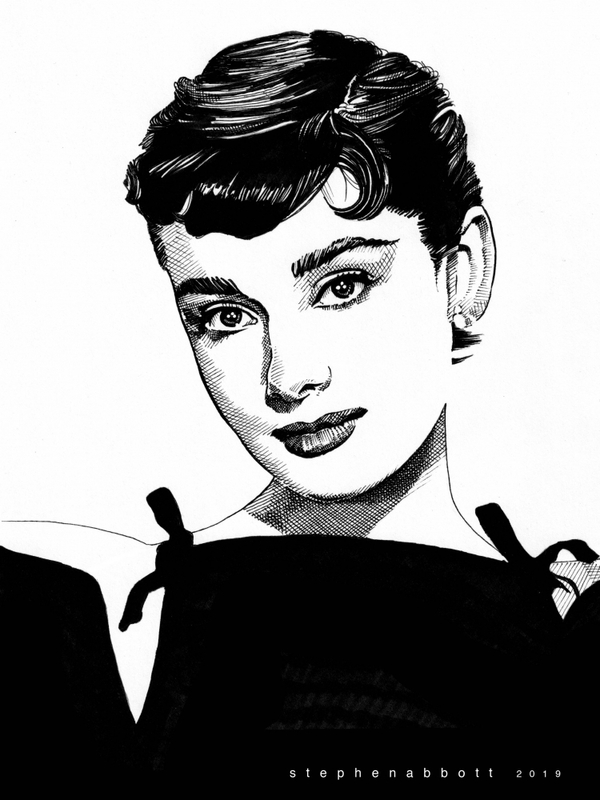 The picture stars Humphrey Bogart, Audrey Hepburn and William Holden. This was Wilder's last film released by Paramount Pictures, ending a 12-year business relationship with Wilder and the company. The film was selected for preservation in the United States National Film Registry by the Library of Congress in 2002. She's looking at me lovingly. Beautiful work, Stephen. Wow ! amazing portrait again dear Stefan ! ... perfect likeness and expressivity ! Bravo my friend ! So lovely!!! Excellent ink portrait as always, Stefano! a work sophisticated and brilliant, like her!